After returning from the land of beef, lamb and potatoes (Ireland) I crave veggies. Lots and lots and lots of them. While it was possible to get yourself a decent salad, and virtually every restaurant or pub had seafood chowder on the menu (and I ate a LOT of that too because it’s way better than our local stuff), colourful veggies just didn’t play a major role in Ireland’s food scene. Granted, the higher end restos were more varied in their offerings, but our pocket book could only sustain eating at those places every so often. So the first meal I made after getting home was a giant stock pot of borscht, the famous Ukrainian red beet and cabbage soup, a true celebration of autumn and vegetables. My version is a modification of a recipe from Foodland Ontario called “Ontario Borscht.” I leave out the white turnip, mushrooms and beans. I’m not really sure why; I just think the beans and the mushrooms would be a very odd texture in this soup, although admittedly the beans are what gives the soup it’s “whole meal” status by adding protein. And white turnips, well I just don’t have a relationship with this vegetable (I really should get to know them). 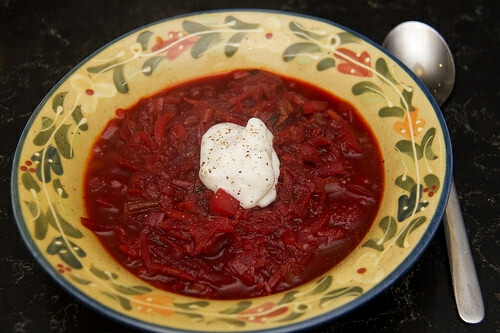 My Mom’s borscht never included these ingredients and frankly this soup reminds me of growing up. Not that we were Ukranian of course. It’s just something she made once in a while. Of course Chris hates beets, and finds this soup a bit difficult to stomach. He can’t easily get a whole bowl down. So it’s really just me that thoroughly appreciates it. As with many soups, this one is better on the second day, and it freezes very well (minus the sour cream garnish of course), so I’ve got a supply to keep me going for months now.